During World War II, thousands of soldiers, sailors and airmen on their way to the Pacific theater were granted their last stateside leaves in Los Angeles. Many of them headed out to the local bars to blow off steam, of course. But in June 1942, the Navy took the unusual action of placing about 30 bars and nightclubs across the city off limits to sailors. “These taverns and bars are not safe or proper places for servicemen to patronize,” a Naval commander told the Times. “Firm handling is necessary to eliminate that undesirable fringe of the industry.” The precise nature of the unsafe and improper activities going on in these night spots was left unstated — but it must have been pretty bad if the Navy felt the need to protect sailors from it, especially since the Navy was sending these same men off to risk their lives in the Midway, Guadalcanal and other death traps in the Pacific. When Your Urge’s Mauve, [go to] the Café International on Sunset Boulevard. The location offered supper, drinks, and the ability to watch boy-girls who necked and sulked and little girl customers who… look like boys. Like Chez Boheme, Cafe Internationale offered cross-dressing performers, but these singers were women dressed in male drag — two who were quite well-known then were billed as Tommy Williams and Jimmy Renard. 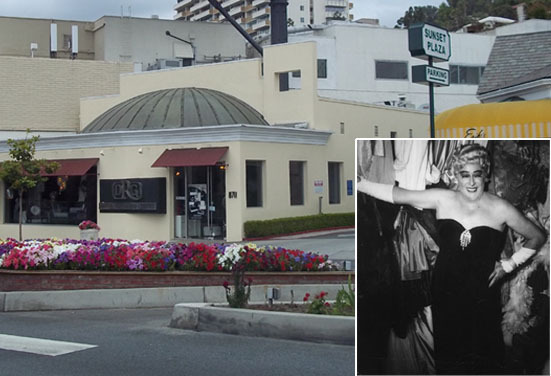 According to historian Lillian Faderman, co-author with Stuart Timmons of Gay L.A.: A History of Sexual Outlaws, Power Politics and Lipstick Lesbians, Marlene Dietrich was in the crowd at Cafe Internationale when Tommy Williams performed one night. As a result of the Navy ban, state authorities revoked the liquor licenses for Chez Boheme and Cafe Internationale. A new club, the Starlit Room, opened in the Chez Boheme space three years later, and Rae Bourbon returned there for a six-month run. Cafe Internationale owner Elmer Wheeler sued in 1942 to have the license reinstated, but he died that December and the club closed for good. His widow Tess opened another club later and became a fixture, along with her partner Sylvia Reiff (who was said to look like Radclyffe Hall), in the burgeoning Los Angeles lesbian scene after the war. I am currently building a structure at the former site of Cafe International. I am very interested in the history of 8711 Sunset. If anyone has any lost pictures of the site, I would be greatly interested. I am going to make a collage of the past to present pictures I find.